And Gave Women the Vote. 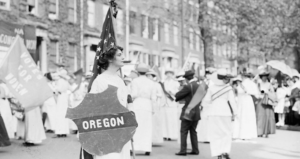 Most histories of America’s woman suffrage movement focus on the East Coast, but it was Western men who initially supported women’s right to vote. In 1890, the new state of Wyoming was the first. After the Civil War and the Emancipation Proclamation, black men received suffrage in 1870. Disappointed that women did not receive the vote at the same time, former abolitionists and women’s rights advocates accelerated their suffrage efforts. In 1869, the first Woman Suffrage organizations were founded in the San Francisco Bay Area. Elmer and Livia Cox of Danville were early members of the Woman Suffrage Association in Contra Costa County. With five daughters, they evidently felt women could handle voting. The question of Womans Suffrage was discussed at considerable length. Very interesting remarks were made pro and con by Sister Jones, Sister Howard, Bro. W. Z. Stone and others…Sister Jones made a motion as follows: How many are in favor of Womans Suffrage? Ayes 11, Noes 12. Mrs. A. J. Young, Sec. Californians in support of suffrage made their mark back East early. Ellen Clark Sargent, an articulate suffrage supporter, went to Washington, DC when her husband Aaron A. Sargent, was elected to the U. S. Senate from California in 1873. There they met and became firm friends with Susan B. Anthony. Senator Sargent introduced the 29-word “suffrage amendment” to the U. S. Constitution in 1878. The success of western woman suffrage reflected a flexible political system and acknowledgment by men that women were essential partners in frontier life. This issue sparked concerns across the country because it meant that there might be changes in women’s accepted roles. Some opponents feared that voting, a non-domestic action, would diminish women’s moral superiority and taint their purity. Others thought that, if women voted, political corruption would be eradicated. Most advocates made the simple argument that giving women votes would give them full rights as citizens. 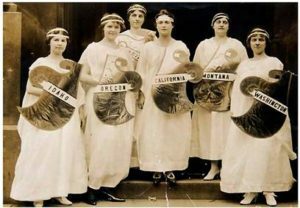 By the time California male voters supported women voting in 1911, five other states had taken the step: Wyoming, Utah, Colorado, Idaho and Washington. Nine more states soon joined California. The West led the way and, by 1920, the 19th amendment to the constitution, the “Susan B. Anthony Amendment,” was passed by Congress and ratified by 36 states. Sources for this article are available at the Museum of the San Ramon Valley and include the Danville Grange #85 minute books, the Contra Costa Gazette and a new Heyday book by Elaine Elinson and Stan Yogi Wherever There’s a Fight.